Welcome Dear Readers! It’s been far too long since we’ve visited the Slightly Creepy Seventies, the decade that just can’t be rivaled when it comes to the creepy factor in fashions, home decor and food. And there you have it, Dear Readers. A little of the Slightly Creepy Seventies to take you on into the weekend. This did creep me out. 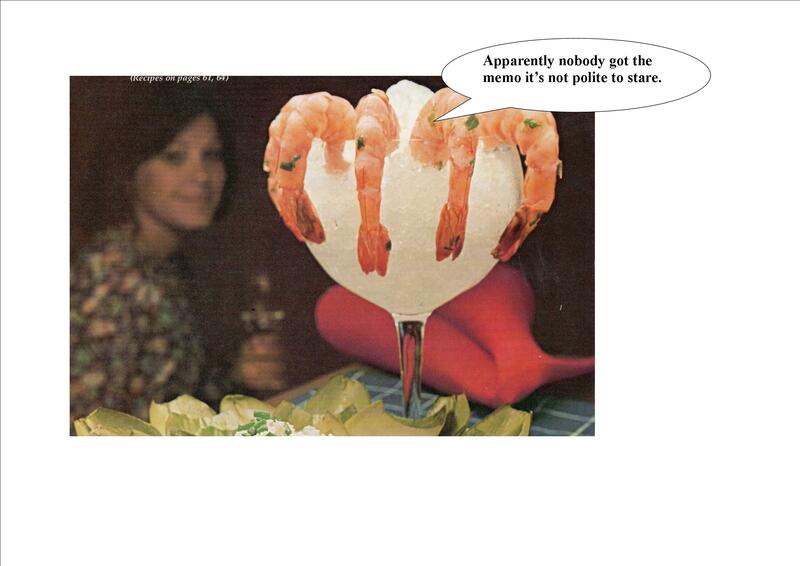 As a child of the 70’s, it makes me want to put on my velvet jacket and chuck a shrimp cocktail… now if only I could get my hands out of this jar… you make me laugh Linda. I would rock that jacket, Masta z.
That’s right cuz he’ll listen to you! He will? Yeah he will!!! I know he has too! Thanks Trent! I’m glad i made you laugh. II was a young adult in the seventies and I remember thinking it was even weird at the time. And it seems like every time I got in the car and turned on the radio they were playing Joy to the World which is fitting background music for the slightly creepy seventies. Wonderful tour of he 70’s! I knew there was some reason for that decade! Proving once again there’s an upside to everything! Even the 70’s!! 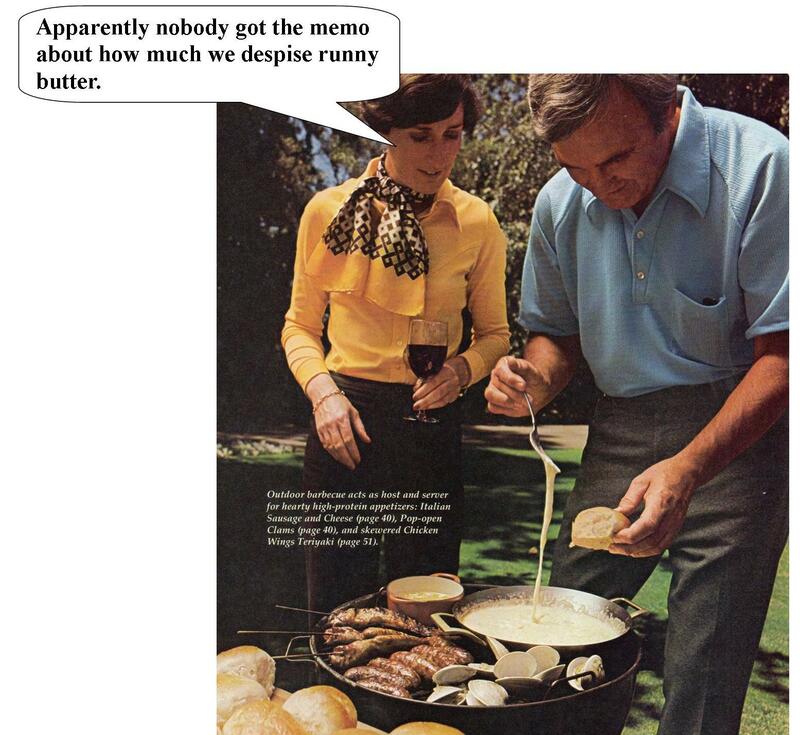 Ohhhhhhhhhhhhhhh sure, put melting butter near BBQ Yups! It won’t burn, naw! Ha! Yes! That lady probably tipped the boiling butter on her platform shoes and welded them to her feet permanently! Yes, that and the fact that she’s stuck in the seventies! Oh we absolutely did, didn’t we? Gads! We were living in the futuristic seventies. I remember feeling sorry for my grandparents because they were so old and their lives were over for all intents and purposed in my mind. I think they were in their early 60’s! 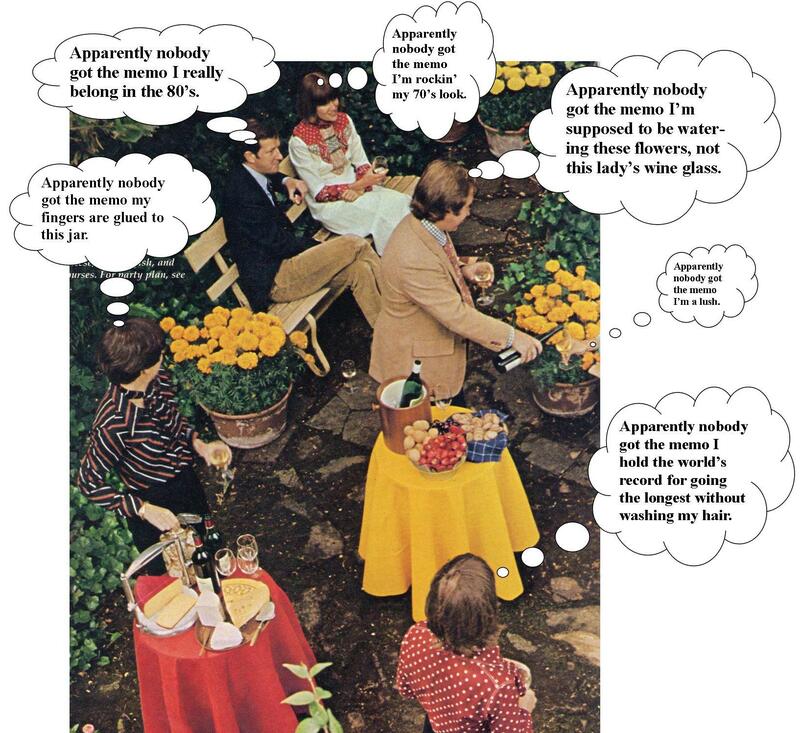 Oh 70’s, why do you persist in haunting us. WE WERE YOUNG! WE DIDN’T KNOW ANY BETTER!!! I’m still trying to get my hair to forgive me for the styles I forced it into. But I’m optimistic and like to think that time heals all bangs. It seems everything looks creepier in Technicolor. That garden party is wet and dark. People are standing in mud and everyone is sort of wandering… They MUST be pod people since that was all the rage in the 70’s. Yes! It does look wet. And dark. Probably moldy too. They are definitely in some sort of weird slightly creepy seventies trance. Sadly one from which they may never wake up. Thanks Pink! And thanks for stopping by this week’s slightly creepy seventies party! It was my pleasure! A reminder of the funky fashion back then! 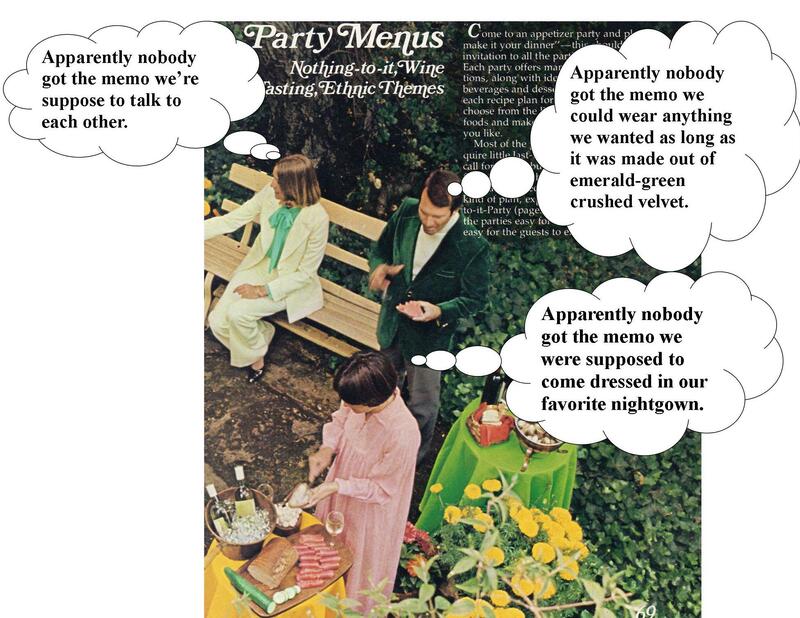 I think I was conceived at that party, green velvet and nightgown look a lot like my parents. 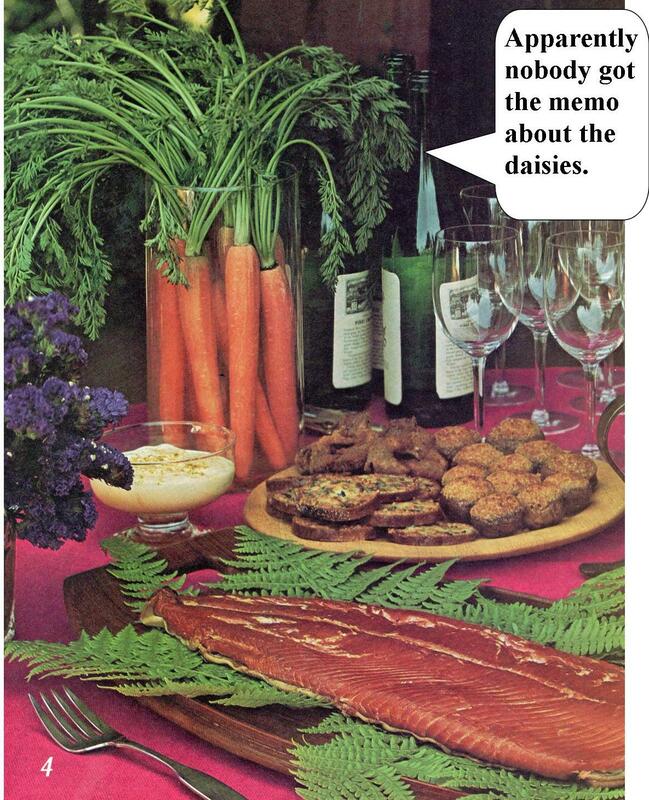 I’m glad they bonded over luncheon meat on hemp bread, such an aphrodisiac. Apparently my crowd didn’t get the memo. We were in bellbottoms, smokin’ weed, and chowing down on chips. I do like the nightgown look, but it should be shorter for the perfect 70s effect.